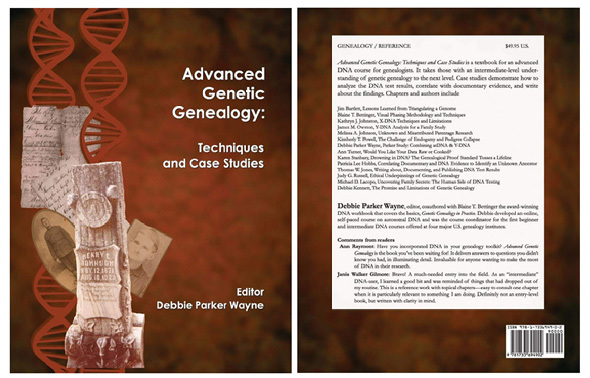 Available now on Amazon is a new DNA book edited by Debbie Parker Wayne, CG, CGL, and pulling together a wide variety of authors and subjects focused on advanced DNA issues and techniques. Advanced Genetic Genealogy: Techniques and Case Studies helps intermediate researchers move up to the next level and advanced researchers apply the new DNA standards and write about DNA. This new book offers an in-home course in advanced genetic genealogy. Case studies demonstrate analyzing the DNA test results, correlating with documentary evidence, and writing about the findings, all incorporating the updated standards for using DNA. Full-color illustrations help the genealogist incorporate these techniques into personal or client research projects. Each of the fourteen chapters was written by a professional genealogist with DNA experience. Eight chapters study real families (some using anonymized identities), including methods, tools, and techniques. Jim Bartlett covers how to triangulate a genome (mapping DNA segments to ancestors). Blaine T. Bettinger demonstrates the methodology for visual phasing (mapping DNA segments to the grandparents who passed down the segment to descendants, even when the grandparents cannot be tested). Kathryn J. Johnston shows how to use X-DNA to identify and confirm ancestral lines. James M. Owston describes findings of the Owston Y-DNA project. Melissa A. Johnson covers adoption and misattributed parentage research. Kimberly T. Powell provides guidance when researching families with endogamy and pedigree collapse. Debbie Parker Wayne combines atDNA and Y-DNA in a Parker family study. Ann Turner describes the raw DNA data and lab processes. Three middle chapters cover genealogy standards as they relate to DNA and documentary evidence. Karen Stanbary applies the Genealogical Proof Standard to genetic genealogy in a hypothetical unknown parentage case illustrating start-to-finish analysis. Patricia Lee Hobbs uses atDNA to identify an unknown ancestor and that ancestor’s maiden name, moving back and forth between documentary and DNA evidence. Thomas W. Jones describes best practices for genealogical writing and publishing when incorporating DNA evidence. Three concluding chapters deal with ethics, emotions, and the future. Judy G. Russell covers ethical considerations. Michael D. Lacopo describes the effect on relationships when family secrets are uncovered, surfacing issues for all concerned. Debbie Kennett covers the current limitations and future promise of using DNA for genealogy. An extensive glossary, list of recommended resources, and index are included. So… a first class guide to advanced genetic genealogy. Now available on Amazon. And yeah, as noted, The Legal Genealogist has a chapter in it — on ethics. Cite/link to this post: Judy G. Russell, “New DNA book now available,” The Legal Genealogist (https://www.legalgenealogist.com/blog : posted 24 Mar 2019). Would this guide help me help two dna cousins who were adopted find their roots? It certainly will help but it’s on the advanced side (hence the name). If you’re just getting into using DNA for genealogy, there are other things to look at and learn from first. I’ve used it some back awhile ago but need to start from the beginning. Love your blog as always and thanks for the in on the book. I just bought it. FYI: Some of the authors will be signing the book at NGS in ST. Charles at Books & Things (booth 401). The book can also be purchased at http://www.mygenealogybooks.com.